Page formatting or the page layout of the document describes how it appears when it is printed. 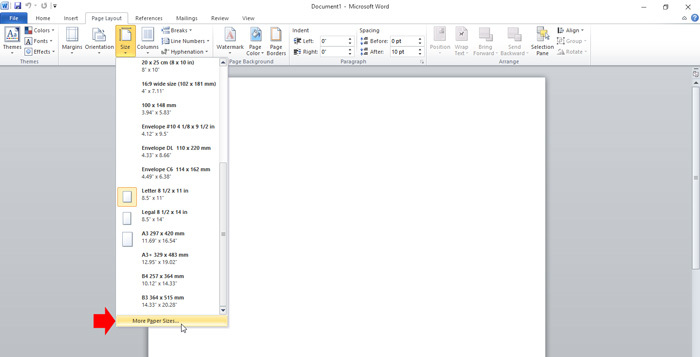 Using Microsoft Word you can easily format the page to what you want to look in the paper. We have already discussed setting page margins in our previous tutorial. Page formatting includes setting the page size, orientation, margins, how may columns, etc. In this article tutorial we will show to you how to format your page before printing. First thing when setting page layout is to know where you want to print the document. If you know the size of the paper that you are going to use, be sure that it will match to the page size of the document. For example, if your paper is a letter (8.5 x 11 in) size make sure it is the same in the size page layout. To set the page size go to “Page Layout” tab, then click the “Size” icon in the “Page Setup” group. It will reveal all the preset page sizes, select the size of your paper. If you can’t find the size of your paper in the preset size, click the “More Paper Sizes” at the bottom last part of the menu. 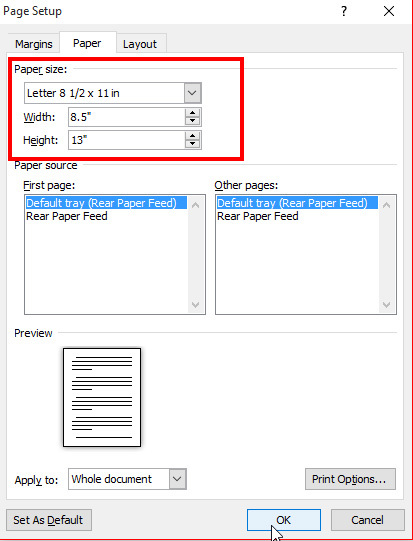 Page Setup pop up screen will show where you can set your desired paper size, enter the width and height of the paper in the field provided or just click the arrow up or down to change the value. Click OK to apply. There are two paper orientation that you can select, Portrait the default page setup where the width is lesser than the height or the paper is in vertical position and the Landscape or the paper is in horizontal position. To set the orientation of the page, click “Orientation” icon in page setup and select whether you want Portrait or Landscape. To create document with two or more columns, you must set it first before you start entering the data. Click the “Columns” icon to reveal the drop down menu where you can select how many columns you want to set. If your desired number of columns is not at the preset, click “More Columns”. 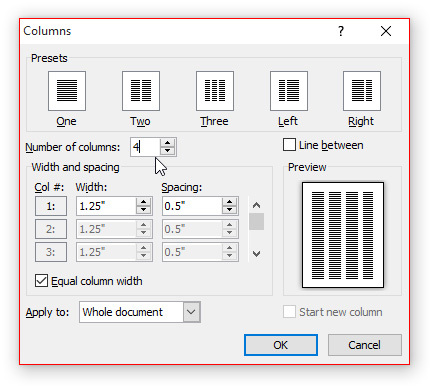 In the Columns window, set how many columns you want, you can also adjust the spacing of every column.